E-commerce, responsive / mobile friendly website for the UK’s No.1 supplier of camonets not to be seen in!. Both the U.K. and US sites have been re-developed for mobile friendly navigation which means they can be viewed and used easily using mobile devices such as phones and tablets. 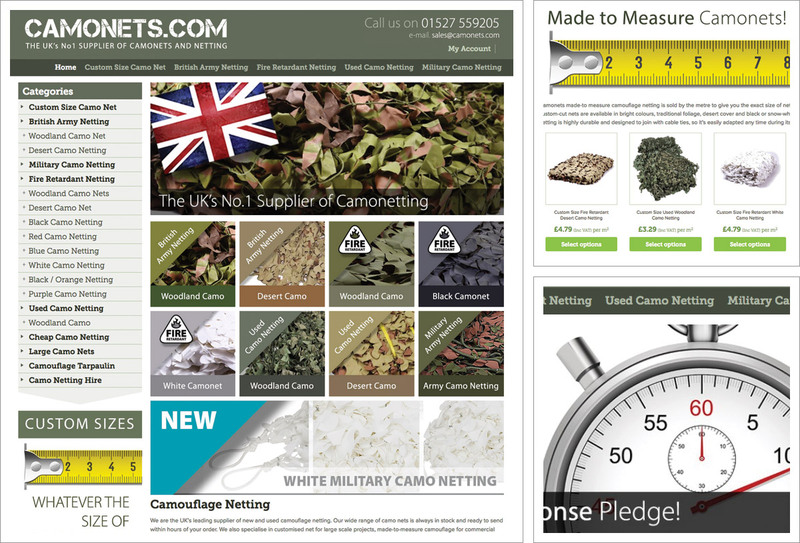 Camonets have a wide range of quality camo-netting products. As well as selling camonets to individuals they also supply larger orders commercially across the leisure industry to safari parks, zoos, event organisers, movie studios and theme parks in both the U.K. and the United States. Netting is no longer just for the army and hunting industries. A branding refresh and revised layouts have given the site a new look and new functionality includes the ability to order bespoke sizes online. The customer simply enters the dimensions required, is presented with a price and they can checkout online as usual. Check-out is handled securely by PayPal, SagePay or WorldPay which means customers have various payment options and for each they may use a credit card, debit card or switch card.The new Camonets website uses an SSL certificate. The https prefix makes shopping with camonets a safe place. An SSL certificate is favoured by Google and may help with SEO and Google ranking but it also gives customers confidence as it provides extra security while they surf and shop.